If you read this blog regularly you know that I LOVE SALAD. But unlike pizza, not all salads are good. Overly dressed and wilted vegetable salads are gross. To be a great salad, you need fresh crispy vegetables, complimentary toppings and a really good dressing that enhances all the flavors. 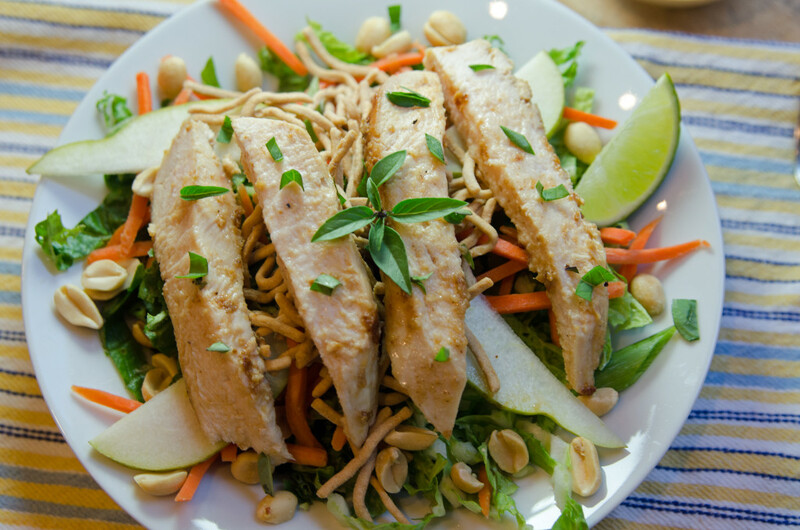 This Asian Peanut Chicken Salad has all that and more. It is filling as a dinner salad and leftovers travel well, even dressed, for lunch the next day. What I love about this salad? 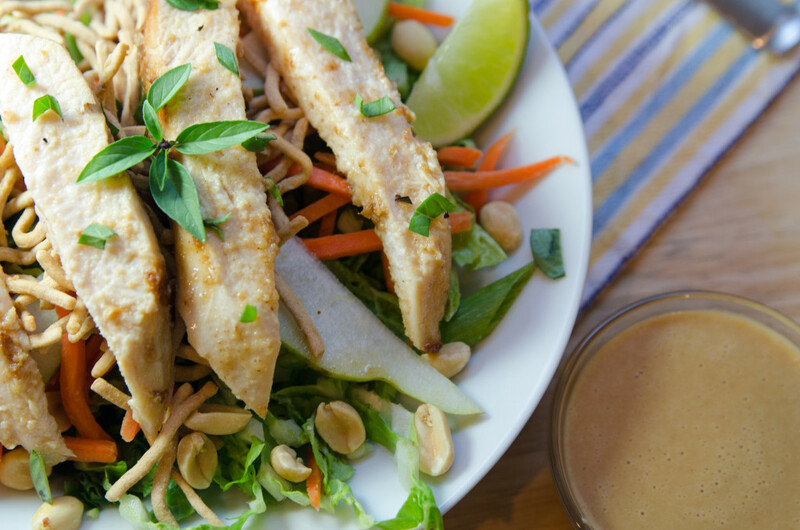 The combination of the sweet pear, the salty peanuts, the tangy dressing, the peppery cabbage and the fresh herbs, it’s a flavor explosion! And, it’s less than 400 calories WITH DRESSING! Pair with a crusty dinner roll and you have an amazing and filling meal. To prepare dressing, whisk ingredients until smooth. To prepare chicken, in a skillet heat sesame oil on high heat. Pat chicken breast dry before cooking. Add the chicken breasts. Cook for just 1 minute then flip. Turn the heat down to low and cover the pan. Cook for 10 minutes. Remove from heat, cover with tinfoil and let rest for 10 minutes. Cut into strips, and sprinkle with salt and pepper to taste. 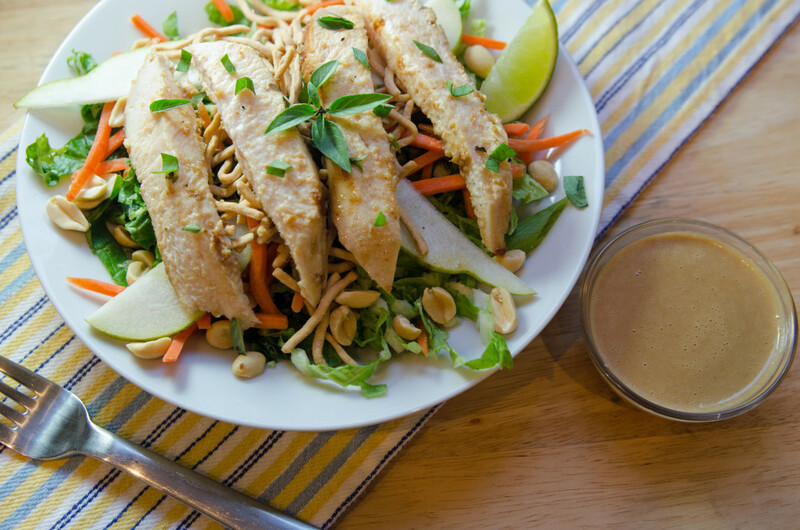 To prepare salad, combine cabbage, lettuce, carrots, snow peas, cilantro, and green onion in a large bowl. Add the dressing and toss to combine. 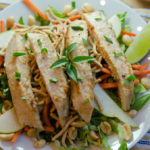 Top with chicken, peanuts and chow mien noodles. Squeeze lime wedge over top. Enjoy!